b is using Smore newsletters to spread the word online. Zeus fell in love with nymph Callisto. Callisto gave Zeus a son named Arcas, Callisto turned into a bear, Callisto saw her son in the woods. She attempted to approach but could only growl. Seeing the bear Arcas drew his spear back to attack. Zeus changed Arcas into a bear and put them both in the Northern sky. Ursa Major is best visible throughout the year but best seen in April. 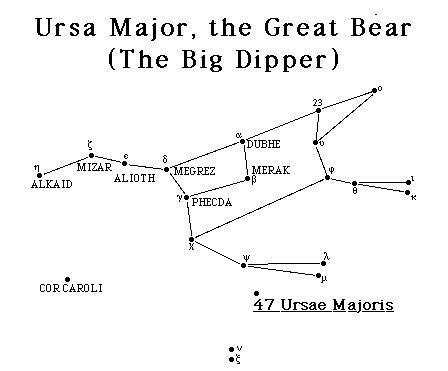 Ursa Major is made up of 17 stars and the big dipper is located inside of the Ursa Major "great bear". Big Dipper located in "big bear"
the big dipper is located in the Ursa Major. 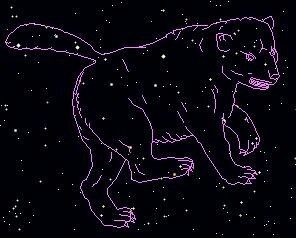 this is the Ursa Major in its full form and out lined to tell it is a bear. the 17 stars each have individual names.